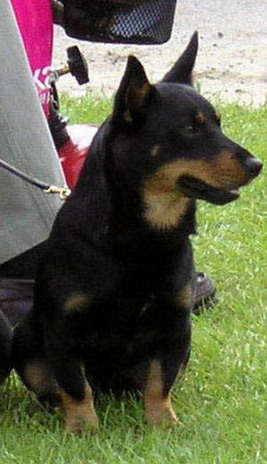 Best Puppy at Crufts 2006. Dog CC (Duffy's 1st CC) at Border Union Championship Show Saturday 14th June, 2008, Judge Mrs Jan Rual. Saturday 13thSeptember, 2008, Judge Mrs Julia Swann. Reserve Best in Show LHC Open Show Sept 2006. Reserve Best Dog at Windsor Championship Show, 26th June, 2008, Judge Mr J Horswell. Reserve Best Dog at Leeds Championship Show, Saturday 26th July, 2006. Judge Mr Ron Parkes. Res Dog CC, City of Birmingham Champ Show, 30th August, 2008, Judge Mr J B Bispham. Well done Duffy, he has worked hard over the past 3 years. Doddsline Duffy Driffield Championship Show 2nd October, 2006, 1st in Yearling Dog. Judge Mrs Ginette Simpson. LKA Championship Show 9th December, 2006, 1st in Post Graduate Dog. Manchester Championship Show 19th January, 2007, 1st in Post Graduate Dog Judge Mr Peter Bailey. .
Border Union Championship Show 17th June, 2007, 1st in Post Graduate Dog. Judge Mrs P Chadwick. Windsor Championship Show, 29th June, 2007, 1st in Post Graduate Dog. Paignton & District Champ Show 11th July, 2007, 1st Limit Dog Judge Mrs P Bailey. Leeds Champ Show 23rd July, 2007, 1st Limit Dog. Judge Mrs F Kaye. Welsh Kennel Club Champ Show18th August, 2007, 1st Limit Dog Judge Mr L Aspin. City of Birmingham Champ Show 1st Sept, 2007, 1st Limit Dog Judge Mrs C E Cartledge. Manchester Champ Show 17th January, 2008, 4th Limit Dog Judge Mr R Baker. Lancashire Heeler Open Show 17th February, 2008, 1st Limit Dog. Judge Mrs R Parry. Birmingham National Champ Show, 9th May,2008, 3rd Limit Dog, Judge Mr John Swann. 1st Limit Dog & Res Best Dog, Lancashire Heeler Club Champ Show, 11th May, 2008, Judge Mr Colin Russell. Southern Counties Champ Show 30th May, 2008.1st Limit Dog. Border Union Champ Show 14th June, 2008.1st Limit Dog, DCC. Leeds Champ Show 26th July, 2008, Res Best Dog Judge Mr Ron Parkes. Darlington Champ Show 13th September, 2008, DCC & BOB, Judge Mrs Julia Swann.